Black Rock Church in Fairfield, Connecticut, featuring a P.A. system made up of RoomMatch® loudspeakers from Bose® Professional. 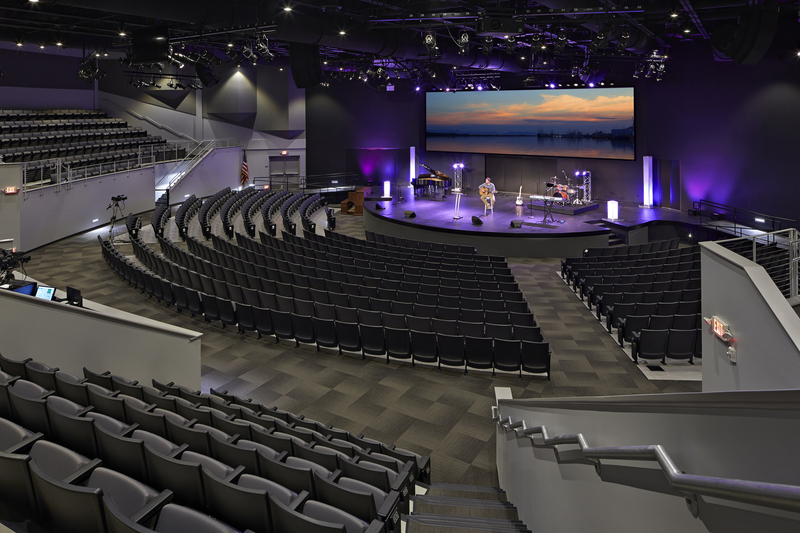 Framingham, Massachusetts, April 9, 2015 – As Black Rock Church in Fairfield, Connecticut, was developing its new facility, church leadership turned to integrator AE Global Media for audio, video and lighting solutions. The new space is much larger than one might expect from a New England church – accommodating 1,000 visitors in the main worship area. The audio system for this space needed to provide even, powerful sound for a wide range of music and worship styles, and AE Global Media, in collaboration with Black Rock’s Technical Director Joe Cichon, ended up installing a large system made up of RoomMatch® loudspeakers from Bose® Professional. The following Bose RoomMatch loudspeaker modules were installed: one RM9005, three RM9010, six RM9020, one RM12005, three RM12010, six RM12020, 11 RMU208 and four RMS218 sub woofers. System processing is handled by a Bose ControlSpace® ESP-00 engineered sound processor, two ESPLink output cards, one AES input card and 10 ESPLink input cards. The system is powered by 10 Bose PowerMatch® PM8500N configurable power amplifiers. Cichon added, “Working with the Bose team was one of the best experiences of our facility build. They were responsive, professional and well equipped and performed above my expectations. The install and results are stunning. Audio perfection.. Every seat has the same dynamic sound, allowing people to choose seating for comfort, and not for sound reasons. At our FOH position, our engineers are confident that every seat in the room has the same audio experience. The Bose system made it happen." Photo Caption: Black Rock Church in Fairfield, Connecticut, featuring a P.A. system made up of RoomMatch® loudspeakers from Bose® Professional.